Business sectors beyond tech are trying to monetize voice. Voice interaction design is a burgeoning field that is poised to streamline process and scale impact. The healthcare industry, in particular, is having a voice-first technology boom. 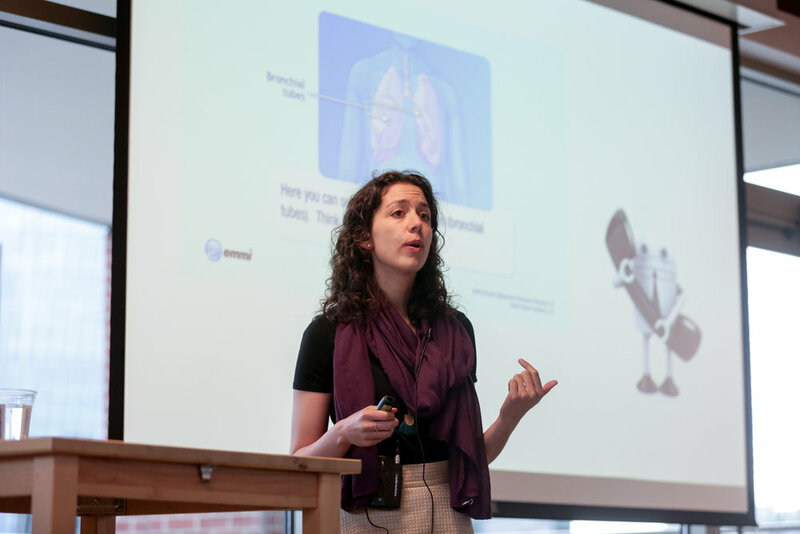 In July, Ilana Shalowitz spoke to the communities of IxDA Seattle and Design for Healthcare at Socrata about voice-first design developments in healthcare. Ilana Shalowitz explained that there are many opportunities to leverage voice-first design in healthcare that scales outreach to patients, and in turn, increases positive health outcomes. Voice-first assistants can transform an automated call into an interaction tailored to patients' needs, whether reminding them of a follow-up appointment, recording their weight or blood sugar levels, or assessing patients' spirits. Voice-interaction programs even have the ability to address more than one purpose in a given call. For example, the initial purpose of a phone call may be to record a patient’s blood sugar levels after a diabetic episode. But the program can also reference the patient’s records to address other follow-up care her doctor has recommended. For example, it can ask if the patient has booked a follow-up appointment, then connect the patient to her doctor's office if she needs to schedule a visit. Shalowitz's data demonstrated that voice-first programs like Emmi Transitions have decreased hospital readmission rates for patients who suffered from traumatic conditions like a heart attack or stroke, which require intense follow-up care. Additionally, medical practices that used Emmi Prevent saw an increase of 60 to 86% of completed mammography appointments. Voice-first technology is also being used to engage the elderly and those with chronic conditions. Voice-activated programs like Jibo and ElliQ respond in ways that present mental stimulation to make reminders to take medication feel not so transactional. These programs provide supplementary caregiving that support independence for older people and give relief to their primary caregivers. People with chronic conditions have also experienced beneficial outcomes with voice-activated assistance that promote healthy behaviors. Someone whose health depends on losing weight needs more than the regular weigh-ins that occur during yearly check-ups. They may also need suggestions on how to bond with friends and family during the holidays that aren't just eating and drinking. Programs like Sensley’s Nurse Molly do just this. Integrated voice-systems are also saving doctors and hospitals time and money by streamlining processes like documentation and providing companion diagnostic tools. True assistance technology is also reducing infections by relieving healthcare works from physically assisting patients with tasks they may be unable to accomplish on their own, like administering medications. meet patients where they are at? These are just a few examples that Shalowitz featured in her talk. Her enthusiasm gave the audience the sense that the potential use-cases are boundless. Nevertheless, there are some obstacles that prevent voice-first assistants becoming ubiquitous in the medical field. The primary barrier is that none of the standard voice assistant devices are HIPPA complaint, so medical practices and hospitals are wary of substituting their current practices with voice-assisted technology. Insurance companies and government-supported programs are also hesitant to subsidize these devices before there’s a clear understanding of where HIPPA stands on them. Shalowitz provided insight into voice-first design techniques from her experience at Emmi Solutions. She emphasized that yielding effective healthcare outcomes with voice-first technology is accessed by using the design process throughout the implementation. Having an understanding of what voice can and can’t do is crucial. The design process allows product designers to craft the right content by engaging patients without overgeneralizing. Storytelling techniques can help engage patients where they are in their care. Voice assistants must speak in plain language, broken into conversational and manageable chunks. Memory is also key to long-term engagement. Patients need to feel a sense of history with the assistant to build health-focused behaviors. Voice-activated assistants should be able to remind patients of what they previously spoke about. Ultimately, Ilana Shalowitz stresses that designing voice-first technology requires asking what success looks like, and the importance of having a clear understanding of how success is defined (prior to designing) will enable voice-first technology to improve health outcomes for many more patients. A big thank you to Socrata for hosting and sponsoring this event. Photographs by Sarah O'Connor.